This week has been a supremely busy one and I haven’t had time to write as much as I’d like about how things are going right now. Thankfully things will slow down a little next week and I can get a little relaxation and rest in. I will say that I am thankful every day that I had the wisdom to choose to have this surgery, and the persistence and determination to stay the course. Lately, I have been noticing NSVs in places I least expected them to pop up. They’re things you don’t expect you’ll ever experience because in your head, you’ve been fat for so long that it’s hard to conceive of these things ever happening to you. Then they happen and you think, whoa…for reals? How is this even possible that this is happening to me? For me, it’s a little of that mixed with how in the hell is this happening to me NOW? Isn’t this supposed to happen later on? Then I realize that I’ve lost nearly a hundred pounds in just shy of four months and it hits me: the body that’s been waiting for me to uncover it for the past 30 years is finally emerging, and it’s freaking me out a little bit. Why? Because every time I look in the mirror, I realize that I’m not seeing the me I’ve always ever known or seen. It truly is a surreal experience to look in the mirror and not recognize the person looking back at you. Today I had to move my car’s seat forward a little more–I’ve already had to adjust it once post-op. The gap between my belly and the steering wheel was quite large. Before, my belly nearly touched the steering wheel, and that was with my car’s seat pushed nearly all the way back. I am starting to see veins on the right side of my upper chest. I couldn’t see them before. I can feel my sternum through my skin. This is a weird feeling, being able to touch bone. It is nearly time for new pants. I had the realization the other day that I am *this* close to being able to buy a pair of dress pants from Talbots Woman. This is exciting to me. We had a faculty meeting today in my school’s Performing Arts Center, which is a 1500 seat theatre with typical theatre seats. I noticed that when I sat down, I had clearance on either side of the seat and that my hips weren’t squished into the seat. Saturday when we were trying to catch the train home from the Fair, we were crossing the tracks in a hurry to get out of the way of the train, and I actually could trot across the tracks. I haven’t done any kind of running in 20 years. I can put my hands on either side of my ribcage and feel my ribs. It is time for new bras–I can pull the band past the last set of hooks on all my bras. When I lay down to sleep at night, my knees touch and it actually hurts because the padding is disappearing. When I sit, I can feel my tailbone. I move around so much faster than I have in a long, long time. I notice that now when I have to go from one place to another in my school building, it doesn’t take nearly as long because I’m moving so much faster now. I can wrap the bath sheets we own all the way around myself without a gap in the front. My rings are so loose that I’m going to go in search of a ring guard this weekend lest I lose any of them. My husband and I can now hug without stooping, and I can put my arms all the way around him now. This is probably my most favorite of the things that have happened along this weight loss journey so far. These are the things I need to remember when things seem too tough. These are the things I need to remember when the scale doesn’t move the way I want it to move. These are the things that make having had this surgery totally worth it. Today was a good protein day: 92 grams. 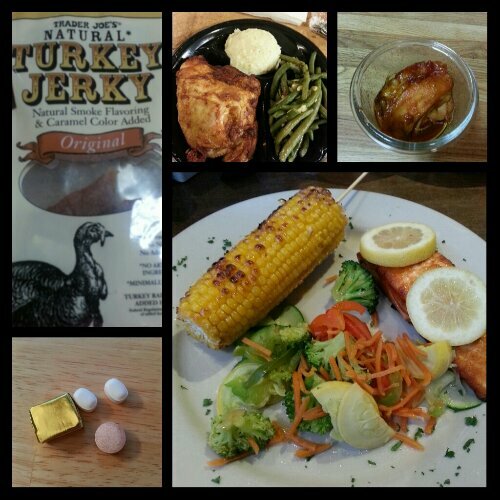 Today’s food choices, from upper right: barbecued boneless skinless chicken thighs; grilled salmon with mixed veggies (I ate a couple of pieces of the broccoli) and grilled corn (I ate a couple of teaspoons of kernels); multivitamin and calcium supplements x2 with iron supplement; Trader Joe’s turkey jerky; leftover baked chicken breast with mashed potatoes and green beans almondine. 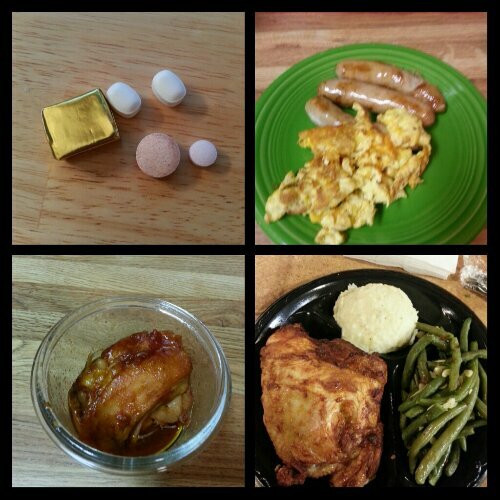 Yesterday’s food choices, from upper right: scrambled egg with cheese and turkey sausage links; baked chicken breast with mashed potatoes and green beans almondine; barbecued boneless skinless chicken thighs; multivitamin and calcium supplements x2, iron supplement and B12 supplement. Not shown: Applegate Farms sliced chicken breast and Trader Joe’s sharp cheddar cracker cuts cheese slices. This entry was posted in being thankful, celebrations, daily bites, eating, little things, post-op, vsg, weight loss surgery and tagged daily bites, head trip, little celebrations, NSVs, post-op eating, post-op life, the little things, VSG, vsg realness, WLS. Bookmark the permalink.